These folded mini-note cards are just a tad larger than business cards. They measure (2.25" x 3.5"). Ideal for thank you notes and gift tags. I call the currently available foursome the "puppy pack". 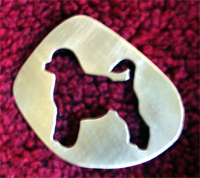 The images are photographs of a young Portuguese Water Dog in a retriever cut. A set of eight includes two each of the images shown below plus envelopes. The Images are printed on the face of the cards with a small white border. The inside of the card is blank unless you choose to add custom text (see below for customization details). Note: The images below are copyrighted by Cozmic Creations. The display resolution for the images below has been reduced in an attempt to thwart image theft. These cards can be customized with up to six lines of text on the inside (below the fold). Blank lines may be used for spacing (see samples). All lines except the first are printed in 10 pt text. Please limit 10 pt text lines to 40 characters and spaces per line. You may choose a san-serif (Helvetica) or serif (Times-Roman) font shown below. The size of the first line may be up to 14 pt as shown in the samples below (character limit depends on point size selected for this line). Note the images below are not actual size, but the scaling (text to card space) is correct. Space is provided on the order form for customization instructions. Photo Customization is available by special order. Create your own note cards using your own photographs. There is a minimum $50 setup fee for this service. Please inquire via email for details. Note: Order as many customized cards as you need in a single order. Since we do not store customization information, re-orders are the same as new orders and the full $11 will be charged for the first 16 cards. 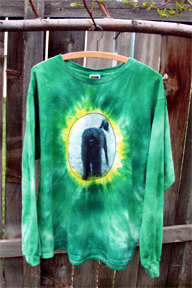 The shirt is hand dyed a rich emerald green. 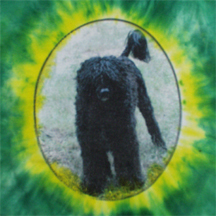 The picture of a young Portuguese Water Dog (lion cut) is centered on the front surrounded by a yellow halo. This is a wonderful shirt for anyone who loves Portuguese Water Dogs. Available as a long sleeved tee or sweat shirt in Men's (unisex) sizes. 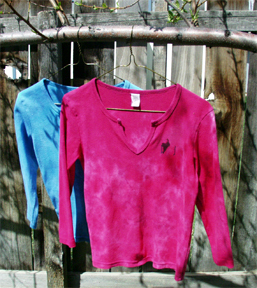 This scoop neck rayon blouse is just a little "classier" than a knit cotton tee. Since all dying is done by hand, no two are exactly alike. The images below provide a good idea of what yours will look like. Of course, the "splatter" pattern will be different for each one. It is designed to fit most people within each size range. Offered in Medium, X-Large and 2X-L women's sizes. (Note, my Corrina was the model for this one too). Detail of Portuguese Water Dog jumping through hoop..
Hand dyed fuchsia or turquoise with a jumping Portuguese Water Dog above the left breast pocket area (there is no actual pocket, so use your imagination). This notch-neck 3/4 sleeved rib knit tee is very flattering and comfortable. 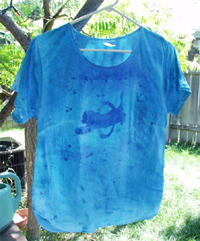 Show off your style and love for Portuguese Water Dogs and Agility. Women's sizes. Note: If you want the shirt without the jumping Portuguese Water Dog, please indicate this when you order. The price stays the same, but some folks may just want a plain shirt (If anything in these colors can be called "plain"). 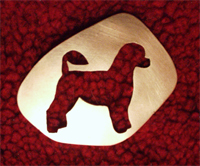 Detail of jumping Portuguese Water Dog. I made myself a little silver necklace and everyone tells me I should be selling it... so here it is along with a few other PWD items. 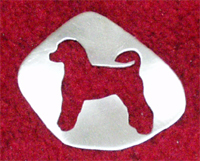 Everything is hand cut, so each little dog has a bit of its own personality. The dog in each piece is just a hair over one inch tall (top of head to bottom of front paws) and a bit more than that in length. I hope to have a few more items in this line in the not too distant future. But for now, if you want to be the first with one of these unique items, order soon. Note: I have one or two (at most) of each of these items. If I sell out of stock on hand, I'll make more but it will take time. 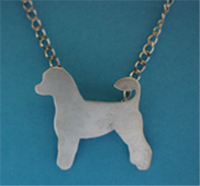 This item is hand cut in sterling silver with a satin finish on a 15" silver chain. 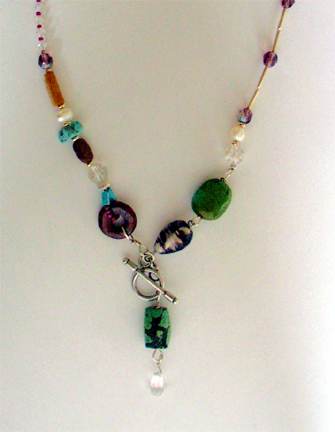 The lobster clasp allows you to wear this at the full 15 inches or to shorten as you wish. 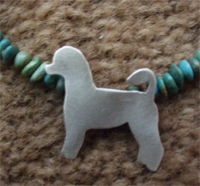 This necklace is also available with a lion clip, please see Tack Pins for a photo of the lion clipped dog. 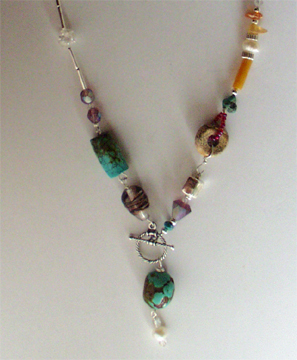 This special version of the silver necklace is the same sterling silver PWD as above, but on a 13.5 inch long single strand of turquoise chips with a lobster clasp and 2 inch silver chain extension for adjustment. I really like the way it looks and I'm hoping you do too. 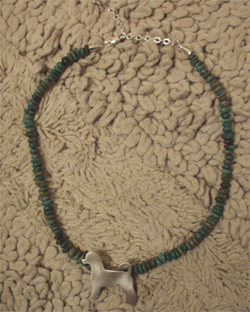 This necklace is also available with a lion clip, please see Tack Pins for a photo of the lion clipped dog. 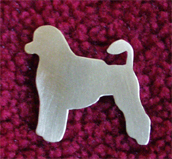 Price: Specify lion or retriever for brass. Copper only available as retriever. Not one to waste much, I decided to find a use for the "negative" images left after cutting out the PWDs for the necklaces and tack pins above. The result is shown below. I like it so much I'm wondering which is really the "left over"... the positive or negative image. In any case, these pins look great on sweaters, vests and coats. Available in brass or sterling, they're a bit heavy for light clothing. I'd like to offer this in copper as well, but the copper is too soft to stand on its own as open work. 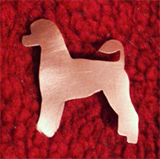 Note: Not all of the dogs in these pins face the same way since imperfections in the metal determine which side i select as the "finished side". If you have a preference, please ask. If i have it in stock, no extra charge. If you really one one way or the other and i don't have it in stock there will be a $5 custom charge and a slight delay in shipping since i will have to make it "on the spot". Sterling silver and turquoise earrings. 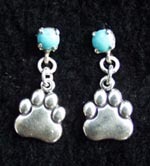 The ear studs have a 4mm turquoise cabochon and the puppy paw charm drop is about 13mm in height. Total length of earings about one inch. Very cute. These pieces are all similar but no two are exactly the same. Made from silver, turquoise and other natural stones, fresh water pearls, crystal and glass beads and more, they provide a lighthearted fun accessory for everything from jeans and tee shirts to business and evening attire. Note: I will try to keep the photos up to date so you will receive the piece you see on this page when you order. However, if two people order the same piece before I have a chance to update the photos, I will let you know as soon as possible and provide a photo of the currently available item if you aren't willing to take one without seeing it first (they will all be very similar, I promise). The watch case holds a Japanese-made quality watch movement that runs with a standard watch battery (included). The long watch bracelet is about 8 inches long and fits medium large to large wrists. The short bracelet is 7 inches long and fits small to medium wrists. Note, I have a 6.25 inch wrist and the 7 inch band fits about right. 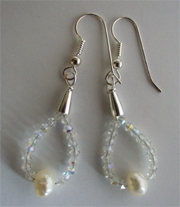 The measurements are approximate and do not include the length of the toggle clasp. If you need one shorter or longer, please email me and I can custom make one for you.